Make your kitchen the heart of your home with Dream Doors Dartford. Speak to our designers and view our stunning collection at your local kitchen showroom in Crayford, which services Sidcup, Bexley and the surrounding areas. Please call now for a FREE no-obligation quotation. 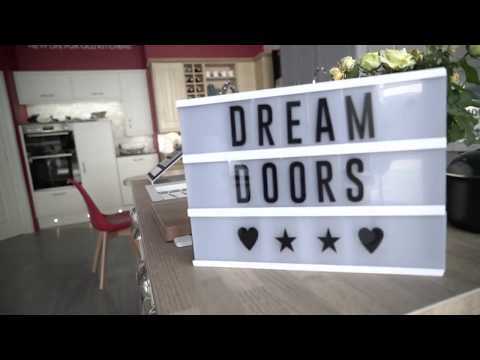 Discover your perfect kitchen at Dream Doors Dartford where Sam and Abdul are waiting to help you create your ideal design. Our Dartford showroom services Sidcup, Bexley and the wider local area and is full of kitchen designs to spark your inspiration with our experts on hand to help. The Dream Doors Dartford showroom, based in Crayford, is a local family run business. Owners Sam and Abdul have lots of experience in creating dream kitchen spaces that have the ‘wow’ factor. As your local kitchen design and installation company, they can discuss all your options in order to find a style that works in your home. All Dream Doors kitchens are designed for the individual, so whether you want a classic or traditional look, or you prefer a contemporary or modern style, we can help. At our Dartford showroom, you will find matt, gloss and woodgrain finishes, as well as a large selection of colours on offer. Our kitchen designers can come to you. Show them your kitchen space and they will provide you with a free, no obligation quote. Sharing your ideas with Sam or Abdul will help them develop a functional kitchen that you love and is fully customised to meet your tastes. Dream Doors Dartford cover most DA postcode locations, including: Dartford, Crayford, Barnes Cray, Stone, Wilmington, Bean, Hawley, Darenth, Longfield, Hartley, New Ash Green, New Barn, Fawkham, Farningham, Eynsford, Sutton-at-Hone, Horton Kirby, Bexley, Bexleyheath, Upton, Barnehurst, Erith, Northumberland Heath, Slade Green, Greenhithe, Swanscombe, Ebbsfleet, Gravesend, Northfleet, Chalk, Shorne, Cobham, Meopham, Istead Rise, Vigo, Southfleet, Sidcup, Foots Cray, North Cray, Longlands, Ruxley, Albany Park, Joyden’s Wood, Blackfen, Lamorbey, Welling, Falconwood, East Wickham, Belvedere, Lessness Heath, Erith Marshes. "Kept us informed of the process and timing, and kept to it. Polite and interested in our kitchen objectives." "A very professional service in all areas, excellent results, admired by everyone who has seen the work." "The service was efficient. Polite and always easy to get in touch with by phone."